It's Pep Rally week and we are here today to share a sampling of the NEW Paper Smooches SEPTEMBER release with you! TWO new stamps and TEN new dies will be available to purchase on August 31st at 8:00pm pacific time. Once our release goes live, you will find our new products HERE. Please check the Paper Smooches blog on Monday, August 31st to see if you are one of the FOUR lucky winners. Now, let's take a look at the new die, Birch Trees, in action! This new die is the perfect thing to get you in the mood for Fall (which I have to admit is my favorite season)! So for my card, I colored my birch tree in two shades of blended ink, a light grey and a darker grayish-tan. For the background, I masked off a circle and then blended some clouds in a dusty blue. Next I perched a little cardinal (from the Warm Hearts set) on one of the birch branches. I love that little bird:) The final step was to add the sentiment (from Scripty Sentiments) which I heat embossed in white on black and then fussy cut. Thanks for hopping with us today! The next stop on the hop is the wonderful Kalyn Kepner! Have an awesome day guys! I love this! The pretty background circle with the trees and the bright red bird - it's gorgeous. Love this bird! Thanks for your inspiration! Love the trees. The circle background really sets it off. Your sky is the perfect backdrop for the trees. I was happy to see the birch trees in action. I like them and your card is so pretty. Wow, such a beautiful creation! And i adore those birch trees with beautiful circled sky background!!! What a cute card. I love the inlaid birch trees. Super against the clouds background. I love this card!! I'm going to have to get the birch tree die. This is a great card with just s bit of twinkling it could be a holiday card! That background sky is amazing! Love the trees, sky, bird.... Great card! Oh my, what a great card!! OMG I must have those trees!! wow! this card feels so peaceful and light! beautiful! These birch trees fit in so well with the paper smooches style. I can see lots of use for this die. What a great card maker/artist you are!!! I love this card, especially your background!! Is there a video that I could watch you do this sky scene!!! gorgeous card, I love it and the tree die!!! So pretty. I love the layout of this design! I love your card. Such a pretty layout. Very Sweet! I love the colors and layers! Wow awesome card! Love the Birch tree die!! Love the two coloured birch die! I love your card, I you created a very peaceful scene. Such a lovely card! I like the bird on the birch trees. lovely card. Hubby loved things with Cardinals in it. JJ, you and Paper Smooches products rock! Clever use of trees in front of cloud circle. And love the cardinal. I love those birch trees!!! So pretty! And your sky background is gorgeous! This release so far is awesome! Love the little cardinal on the trees! Oh wow!!! Those trees and the bird look amazing with that gorgeous background! GREAT job!! I am just loving this card...you do such a great job pulling all the elements together. Happy the one who receives this card in the mail! Beautiful card--love the texture on this card. Thanks for sharing. Fabulous card!!! Wonderful sky background and I adore how you added the cardinal in for a pop of red amongst the birch trees! I love the background with birch trees on this card. Your card is just Beautiful! Your card is so beautiful--that cloud background is fabulously created! Soooooo cute! This dies is my favourite from the new release and your card is so sooo soooooooo cuty! Beautiful! I love the rustic look of this tree die! I love that little bird on the tree. Your design is amazing. Thanks for sharing. Really gorgeous. 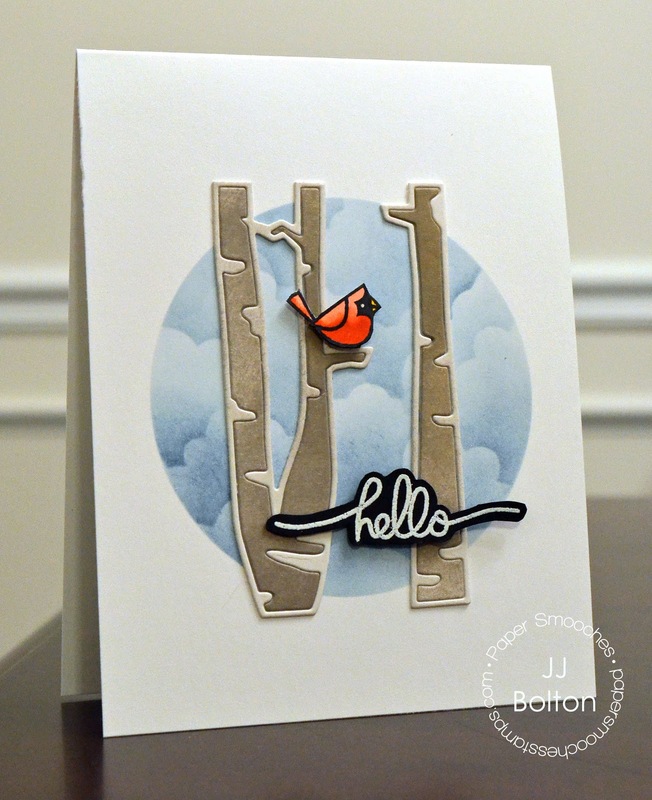 Love the cloud background - the perfect thing for those awesome birch tree dies! Love those trees and that tiny Cardinal! Such a cute design! Love this card and that great new birch tree die! I love the cardinal and the sky background! Amazing card.I love background on this card and New Birch tree dies!!! Thanks for the great blog hop! Love your use of the Birch Tree Dies with the cardinal. The cloud background looks so real and fluffy too. The clouds look really pretty. This is such a fabulous design, love how you combined the different elements on your card, very pretty! Love this card! I love the birch trees!! I love these trees even more now that I've seen them on a project. What a lovely card! Love the colors so soft. I like these trees very much. What I've never done before is to do a cloudy sky within a circle. I really like that technique. A beautiful card - I can feel the chill in the air. Love the birch tree dies and how you used 2 different colors. Love your card!! The blending is fabulous!! The cardinal is adorable and our state bird!!!! No body does that cloud background like you! Beautifully blended. Love the new die cut and the pop of red from the cardinal JJ! Absolutely beautiful! I love the background! very very pretty. Thank you for sharing. What a cool card! Awesome! The hello first caught my eye but those tree branches are awesome! Love this card. Your coloring is fantastic. I Facebooked about the blog hop. I twitted about the blog hop. AWESOME card! 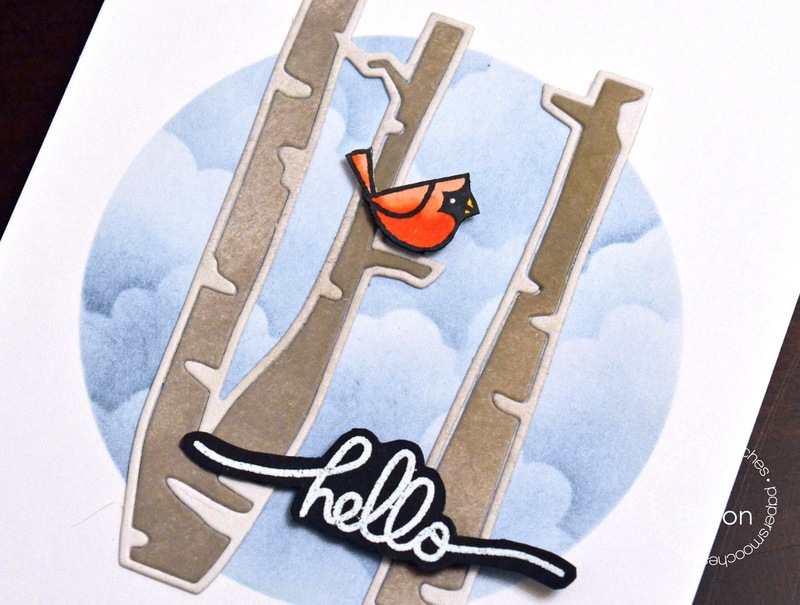 I'm in LOVE with the birch tree die! Great design and a great new release. Oh oh oh such a gorgeous card! I'm in love with the cardinal, and the texture of the birches, stunning! LOVE your BEAUTIFUL trees, LOVE your INK-A-LICIOUS cloudy background, LOVE your SWEET scene, LOVE IT ALL!!! Awesome card...love that little red bird perched in the trees. WOW! This is soooo cool. And a stunner. Love the simplicity, but yet with SO much detail! those clouds!! Gosh, just so well done. Love the things you make! :) Phew, good stuff. I'm a sucker for Cardinals and I love that scripty hello! Wow, your card is gorgeous!!!! The cloud background is beautiful!!!! Absolutely beautiful. I can imagine it done itch snow too! Wow, what a terrific card! It looks like the birch trees are pieced together, and your background is beautiful. The cardinal adds such a nice pop of color, too! Great ideas!! Beautiful scene, I love this dies! Oh my goodness - this is amazing! LOVE those birch trees! Beautiful - love the trees and the cardinal! I love, love, love everything about your beautiful card. Thanks for sharing. I shared a release post here on my blog. Love those birch trees along with the cardinal! Oh, what a charming CAS card, JJ! I love how you placed the birch trees with that darling Cardinal...WOW! Fabulous definition in your clouds, too! Wow--a beautiful and soothing card! Beautiful blending! Love the new dies and how you used them on your card! Very pretty card design. Fall is my favorite time of year too. Wow, I just love this card! Those birch trees are going on the must have list! Woooo I am lovin' the "inlaid" die cut looks. Your birch trees are MARVY pretty! The birch trees are perfect against your cloud background! OMB! I love the cloud background! Oooh love that background. What a sweet and elegant card! Love the tree dies and background coloring. So beautiful! Wonderful design....really like the trees and bird dies! What a beautiful card, nice tree die and cute bird. Wow, your cloud background is stunning! What alovely card! A great wintery scene with a sweet redbird! What a lovely card. The bird completes the scene so well. Your clouds are perfect. Like the black background for the sentiment. love the trees! great card. Beautiful card. Love the tree die cut! Lovely card! I've always been partial to birch trees. They have such beauty with the white bark. This die is my favorite from this release! You did a superb job showcasing it! Fabulous card - love the tree die and the background clouds. I've shared about the hop on FB! JJ, this card is just gorgeous! Love the card with the little cardinal. Just makes it! Awesome and just so cool looking - that sky behind the trees is the BOMB.COM!!! So wonderful!! This is so clever and so adorable. Love it! You really nailed the coloring of the birch trees, I just love them! And I facebooked the blog hop too!